One aspect of Nicolas Cage’s career that I’ve neglected so far is his unexpected transformation into an action hero in the mid-1990s. At the time, it seemed like a major stretch for the quirky, nuanced star of comedies and offbeat films to shift into the starring role in big-budget tentpole movies. I’m not counting Fire Birds, a forgettable 1990 picture about daring helicopter pilots. Cage’s shift began in The Rock, a Jerry Bruckheimer hit about terrorists overtaking Alcatraz and threatening San Francisco. But even in that picture, Cage also plays an offbeat, dorky guy who takes action only when unexpectedly forced into the story by Sean Connery’s grizzled veteran. The tremendous success of this film would have a major effect on the future trajectory of Cage’s career. Starting with that picture, I’ve chosen three movies from this phase and discussed them below with more details. The second in a string of bloated Michael Bay juggernauts (Bad Boys, Armageddon, etc. ), The Rock manages to provide a pretty engaging story while being utterly ridiculous. As I mentioned above, Cage isn’t stretching too much from his unconventional persona here. His ridiculously named character, Stanley Goodspeed, is pretty much the only guy who’s not a gun-toting soldier or mercenary. This “fish out of water” scenario explains why this movie works better than most of Bay’s work, especially Pearl Harbor and the Transformer movies. Cage does too much shouting to convey emotion as Goodspeed, and Connery is much better as the mysterious former Alcatraz prisoner. However, it’s an interesting performance that’s worth checking out if you can handle all the bombast from Bay. 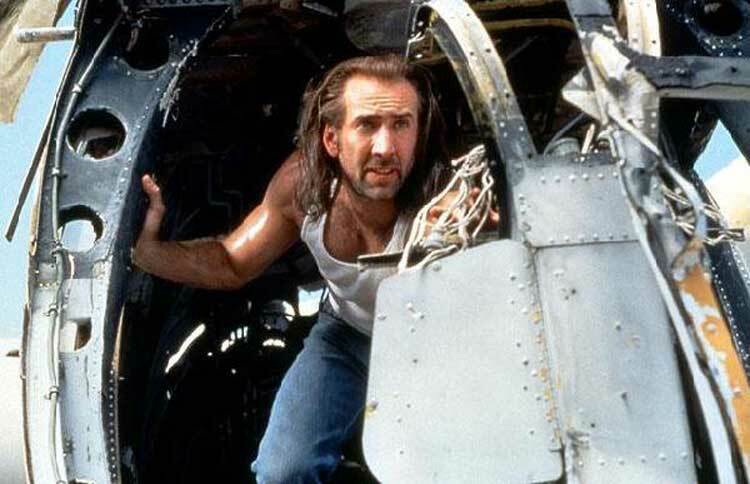 Once again following the Bruckheimer formula, Con Air brings together all manner of scenery-chewing actors to play villains taking over a passenger jet. John Malkovich, Ving Rhames, Steve Buscemi, Danny Trejo, Dave Chapelle, and M.C. Gainey are just a few of the crazed inhabitants on this plane from hell. Cage plays the stoic, beefed-up everyman trying to bring down their plans. His Cameron Poe (another great name) was serving time with the nasty gang, but he obviously has a good heart. How can anyone with such ridiculous flowing locks be a bad guy? Poe is easily the most straight-up action role of Cage’s career, and Director Simon West (The General’s Daughter) matches Bay with some overblown set pieces. Even when you consider the strong cast, Con Air is disappointing and hasn’t aged well. 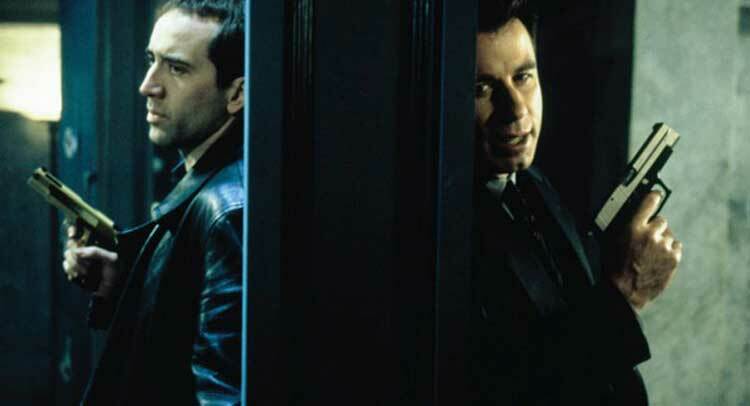 Easily the best of this group, John Woo’s Face/Off takes another ridiculous premise and delivers a highly entertaining movie. Cage and John Travolta star as long-running rivals who end up switching their faces through a new surgical procedure. At the start, Cage is the maniacal villain Castor Troy, who accidentally murdered the son of Travolta’s federal agent Sean Archer while trying to kill him. In the opening sequences, Cage is totally insane and makes Troy a completely over-the-top enemy. After Archer takes his face, the actor mimics Travolta and underplays his scenes. This is the tougher job than playing big, and Cage manages to make his Archer believable. Woo does some of his best work in his American films constructing exciting action sequences, and the result is a classic action movie. These three choices stand apart from Cage’s later success like the National Treasure films, which are adventure movies, not bruising action pictures. Their success also pushed him further into the mainstream consciousness as a bankable star. Even with some popular roles in the past decade, he’s fallen well short of that status in recent years.